Sunlight spills into your home. You’re still in your pj’s, maybe the dogs haven’t even woken up yet. 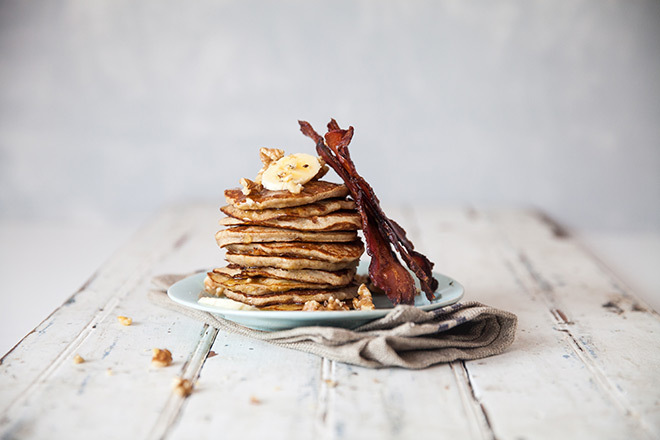 Get a cup of coffee on the go – maybe you like your old faithful moka pot – and put those overripe bananas to good breakfast use with this banana flapjack recipe. This is the beginning of good breakfast time banter. When you can enjoy making something, that comes with the added benefit of guilt free eating, you discover food nirvana. 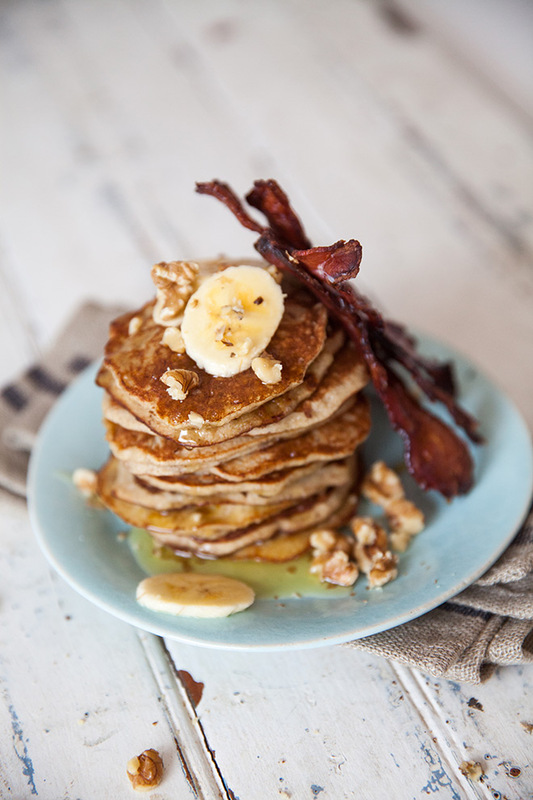 Made with only 3 core ingredients; pureed ripe bananas, eggs and ground almonds – these breakfast flapjacks are wholesome and sugar free. The crackling, crispy honey glazed bacon and walnut crunch shouldn’t be an optional add on – it’s an absolute must. 1. In a mixing bowl, combine the pureed banana, eggs, ground almonds, spices and salt until your batter is smooth. 2. Heat a little butter in a non-stick frying pan over moderate heat. 3. Spoon in heaped tablespoons of batter to form flapjacks. 4. Gently fry until air bubbles appear on the surface and edges of the flapjacks. 5. Carefully flip them over and fry for another 20 seconds. 6. Place flapjacks onto a cooling rack and reheat in a 180°C oven for 8 minutes if need be. 7. To make the crispy, honey glazed bacon, arrange the bacon slices on a roasting tray and roast at 180°C until crispy. 8. Brush honey onto the hot crispy bacon and pop into the oven for another 2–5 minutes. Allow to cool slightly to crisp up even more. Serve with some slices of fresh banana, crunchy chopped walnuts and a good drizzle of honey. A flapjack seems like such a humble thing when unadorned and served with a melting cube of butter, trickling down the stack. So tell us, what was your breakfast conversation all about? How do you like to enjoy your flapjacks? Tell us in the comments below. We’d love to hear your beautiful stories.